The Gaenovium 2014 conference has been covered on other blogs, and we’ve collected the links for your convenience. The blogs referenced here are in Dutch, German and English. Updated 24 & 25 October 2014 with a few additional links. Denie Kasan, the Dutch representative of MyHeritage, our main sponsor, accompanied MyHeritage Chief Architect Ran Peled to the conference and posted a write-up on the Dutch MyHeritage blog: Gaenovium – waar technologie en genealogy samenkomen (Dutch). 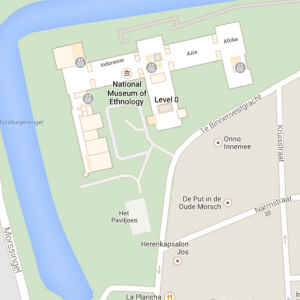 The Nederlandse Genealogische Vereniging (NGV, Dutch Genealogy Society) posted a news item on their website: Gaenovium: innovatie in genealogie (Dutch). The German Verein für Computergenealogie e.V. (CompGen, Computer Genealogy Society of Germany) posted about Gaenovium in their 2014 October newsletter: Computergenealogie/2014/10: CompGen in Leiden/NL (German). Timo Kracke discussed Gaenovium in his 25 Oct 2014 podcast: Der Genealoge: Podcast #25 Archion – Das Kirchenbuchportal, Rückblick zu Gaenovium & Famillement (German). Louis Kessler flew in from Canada to present Reading Wrong GEDCOM Right, and did two blog posts on his Behold blog: #Gaenovium and #Famillement in Tweets and Gaenovium Final Thoughts. 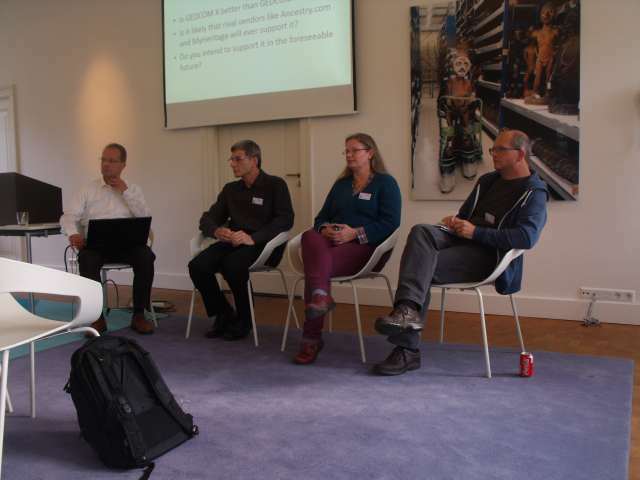 Sue Adams discussed the conference in Mondays with Myrt – 13 Oct 2014 (10:00 – 18:55) and posted an account of the event on her Family Folklore blog: Gaenovium – Keys to Open Data and Open Standards. She later followed up with Dutch October, which links to Going Dutch, starting with Civil Registration on the World-Wide Genealogy blog, an introduction to Dutch Civil Registration. and posted again after the conference: Gaenovium Conference Updates. This entry was posted in blogging, Conference, Gaenovium on 2014-10-17 by Tamura Jones. Gaenovium 2014 is over, but everyone made new friends. We still have the memories – and the slides. Here is one slide from each Gaenovium 2014 presentation, highlighting the diversity of Gaenovium 2014 topics, in the original presentation order. 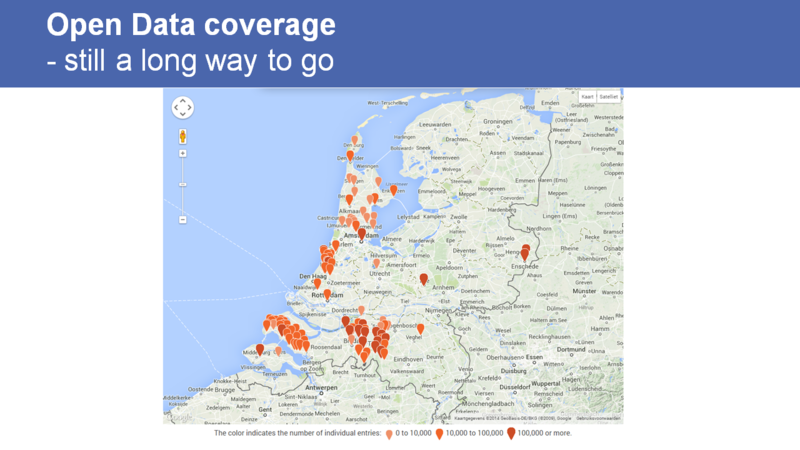 A slide from Bob Coret’s Open Data in the Netherlands, showing availability of data from Dutch archives. 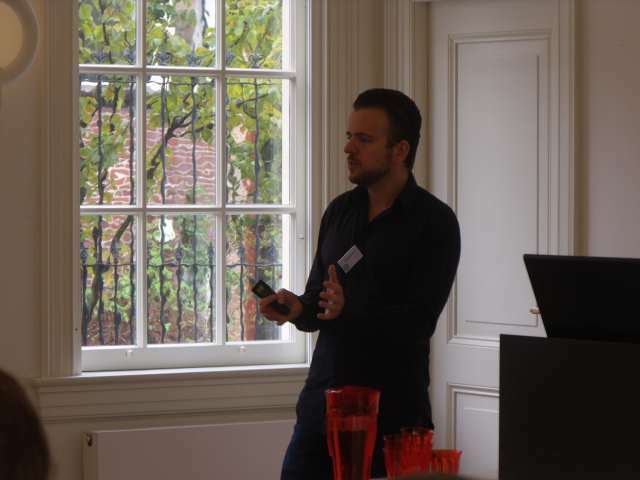 Marijn Schraagen’s presentation, Algorithms for Historical Data Linkage, discussed algorithms in detail. 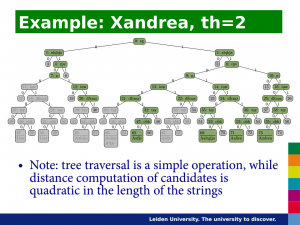 Michel Brinckman’s presentation, The A2A Data Model and its application in WieWasWie, provided a brief overview and then dove into the XML details. 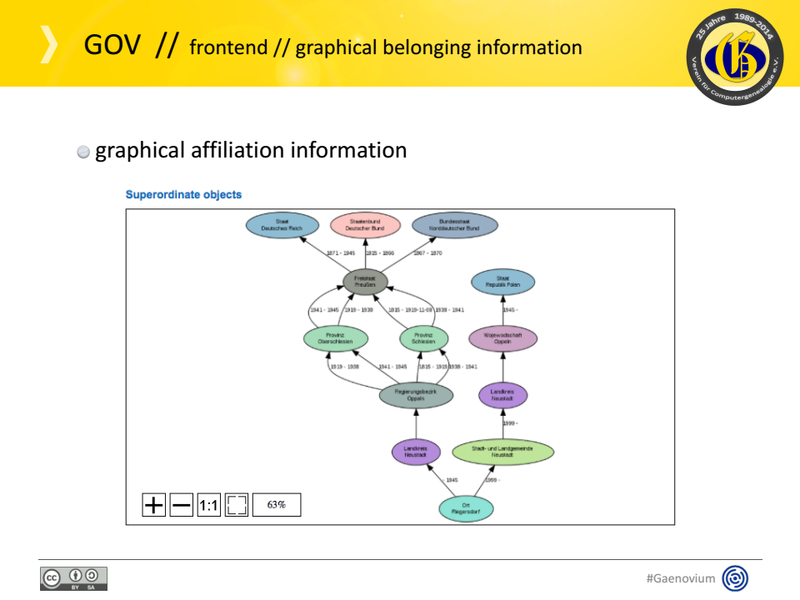 A slide from Timo Kracke’s presentation, GOV: The Genealogical Gazetteer API, shows that place names are not simple. The CONC tag is of the things Louis Kessler discussed in his presentation, Reading wrong GEDCOM right. He included this helpful summary. Bob Coret moderated the panel discussion, Current & Future Genealogical Exchange Standards. The first questions were about GEDCOM. All the slides for all the Gaenovium 2014 presentations, including the panel discussion, are now available on the Gaenovium 2014 presentations page. 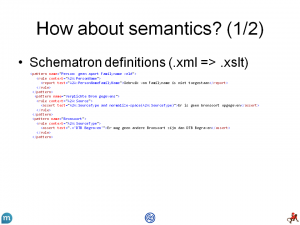 This entry was posted in Conference, Gaenovium, Technology and tagged presentation, slides on 2014-10-13 by Tamura Jones. Bob Coret presenting about Open Genealogy Data in the Netherlands. 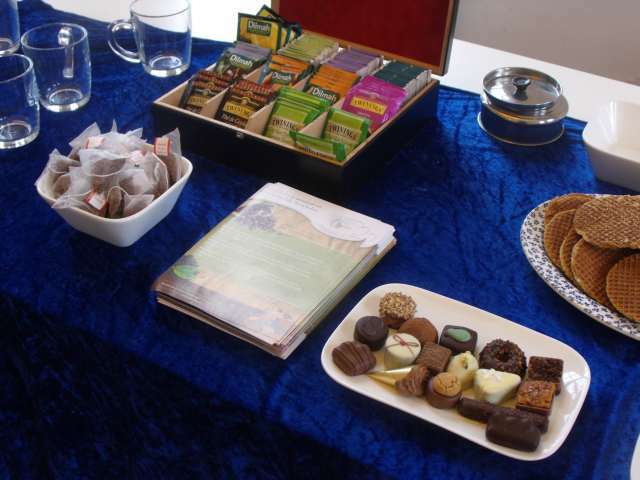 A selection of fine teas, bonbons and stroopwafels. Michel Brinckman explaining a feature of A2A. Louis Kessler presenting solutions to GEDCOM problems. Drs A. delivering the conference lunch. Audience listening to Timo Kracke’s presentation on GOV. Bob Coret moderating the panel consisting of Louis Kessler, Sue Adams and Phil Moir. 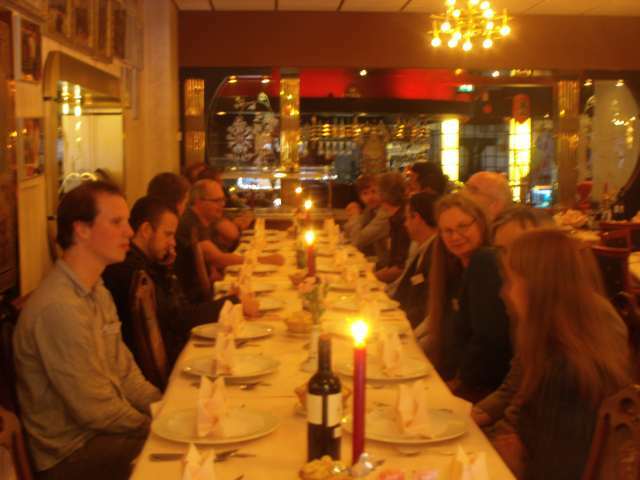 Conference Diner at Asian Palace. This entry was posted in Conference, Gaenovium and tagged photos on 2014-10-08 by Tamura Jones. GEDCOM is the de facto genealogy data exchange standard. The mainstream version is GEDCOM 5.5.1, with some vendors still using GEDCOM 5.5. GEDCOM 5.5 was released on 31 December 1995. GEDCOM 5.5.1 was released on 2 October 1999. That is 15 years ago today. The current version of GEDCOM is 15 years old now! Fifteen years is a long time in the software industry. GEDCOM 5.5 is older than USB and PNG (1996), older than Google (1998), and the Microsoft IntelliMouse (1999). GEDCOM 5.5.1 predates XHTML (2000), Windows XP and Mac OS X (2001), Facebook (2004), twitter (2006), the Apple iPhone (2007), Dropbox, Evernote, Google Chrome and Android (2008), and the Apple iPad (2010). GEDCOM 5.5.1 is older than MacFamilyTree (1998), MyHeritage and RootsMagic (2003), Geni.com (2006), New Family Tree Maker (2007), MyBlood (2009), Chronoplex My Family Tree (2011) and Behold 1.0 (2012). GEDCOM 5.5.1 is older than all genealogy APIs, all mobile genealogy apps and cross-platform genealogy syncing technology. The GEDCOM 5.6 specification is dated 18 Dec 2000, but it was never publicly released. Until the publication of the GEDCOM 5.6 article early in 2011, most genealogy software developers did not even know it existed. For more than a decade, its existence was practically a secret. Once you know that its internal title (Document Properties) is GEDCOM 5.5.2 with XML , it does not surprise that the difference with GEDCOM 5.5.1 is so minimal that there is no reason to use GEDCOM 5.6 instead of 5.5.1. Genealogy software vendors who know about GEDCOM 5.6 are ignoring it just as much as vendors who don’t know about it. 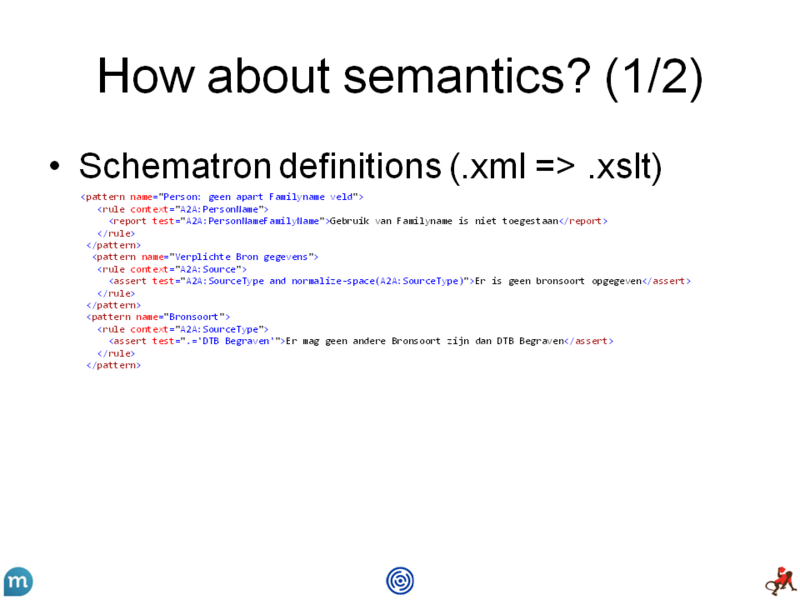 The W3C started work on XML in 1996 and introduced XML version 1.0 (First Edition) in 1998. There was much buzz around XML in its early years, with many organisation creating XML-based versions of new and existing standards. 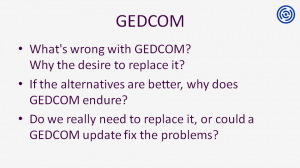 The overview of GEDCOM alternatives shows how many GEDCOM alternatives have been introduced since GEDCOM 5.5 and 5.5.1. Many of these are based on XML. Michael Kay proposed GedML, an XML-based version of GEDCOM in 1998. GedML is the second GEDCOM alternative. The first is InterGED, later known as Event GEDCOM, proposed in 1994 by CommSoft, creators of Roots and Visual Roots, which, after being bought by Palladium, became Ultimate Family Tree and Family Gathering. 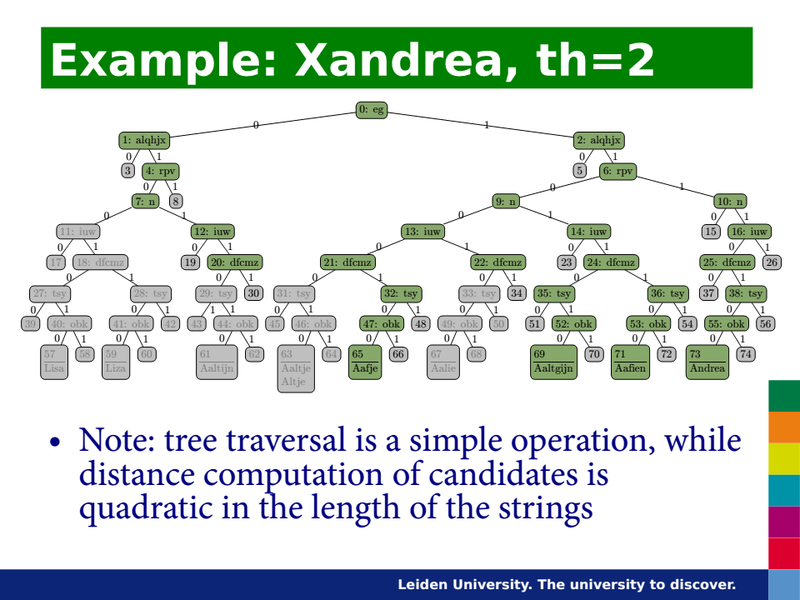 Dynas-Tree, developed by Gerhard Bauch, was probably the first program to provide export to GedML. Dynas-Tree is no longer being developed, but Dirk Böttcher’s Ahnenblatt will also export to GedML. Confusingly, the briefly available It’s Our Tree Home Edition, later renamed to DynasTree Home Edition, is not related to Dynas-Tree, but is in fact a lite edition of Ahnenblatt. The GEDCOM 5.6 specifications contains GEDXML, a GEDCOM alternative. GEDXML is the GEDCOM lineage-linked form in XML, and it is practically identical to Michael Kay’s GedML. That does not imply that FamilySearch adopted GedML. FamilySearch did not make GEDCOM 5.6 public, but decided to abandon both GEDCOM and GEDXML, to develop the considerably more ambitious GEDCOM XML. FamilySearch made a lot of noise about GEDCOM XML. The public GEDCOM XML draft (2001) and a GEDCOM XML Beta (2002) were widely discussed, and not just within the genealogy community. FamilySearch’s GEDCOM XML even made the front page of Microsoft’s MSDN Magazine . The May 2004 issue contains XML Data Migration Case Study: GEDCOM, by Aaron Skonnard, author of several XML books published by Addison-Wesley. It discusses how to convert GEDCOM 5.5 into GEDCOM XML using the XML classes in the Microsoft .NET Framework, using an intermediate XML format (GedML/GEDXML), complete with C# sample code. After the release of the GEDCOM XML Beta, FamilySearch grew silent about GEDCOM XML. As time went by, it became apparent that FamilySearch had abandoned GEDCOM XML. Ahnenblatt will export data to GEDCOM XML, but not import from it. Early in 2011, word leaked out that FamilySearch was working on SORD, and late in 2011, GEDCOM X was revealed. Like GEDCOM XML, FamilySearch GEDCOM X is an XML-based format. Just as with GEDCOM XML, the name is misleading; GEDCOM X isn’t GEDCOM at all, but yet another GEDCOM alternative. Mid 2012, FamilySearch released a GEDCOM to GEDCOM X converter, but it only converts part of the data, and still doesn’t convert from GEDCOM X to GEDCOM at all. Many did not see FamilySearch’s attempt at yet another genealogy data format as a response to any other GEDCOM alternatives, but as a response to the creation of independent industry standardisation groups in 2010. The history of GEDCOM X does not start in 2011, it goes back to 2008 or earlier; comments in the GEDCOM X source code imply that GEDCOM X is part of a Data Framework project inside of FamilySearch, which has been going on for an unknown length of time. The decision to publish part of that Data Framework, and publish it as GEDCOM X seems to have been prompted by the standardisation efforts, and the GEDCOM X about page practically confirms that. Up through 2010, FamilySearch had been busy with other important things, like online access to their huge collection of records. But around 2010 a lot of notable events–including the sprouting of some impressive standardization efforts–came together to raise the priority of a new GEDCOM. FamilySearch opened up the GEDCOM X site early in 2012, during a presentation by Jay Verkler. In that presentation, Verkler claimed that FamilySearch and others are working on GEDCOM X, yet in all the years since his claim, no third-party vendors have come forward expressing support for GEDCOM X. The GEDCOM X site originally positioned GEDCOM X as the new industry standard, but that did not last long. In August of 2012, FamilySearch admitted that GEDCOM X is not vendor neutral, but that supporting FamilySearch Family Tree (FSFT), their own product, is the only real GEDCOM X requirement. Soon thereafter, FamilySearch changed the positioning of GEDCOM X from industry standard to open source project. OpenGen and BetterGEDCOM both formed in 2010 with the goal of creating a new standard for genealogy. OpenGen is no more, and the rather informal BetterGEDCOM morphed into FHISO, a formal organisation. Although the creation of FHISO happened upon the instigation FamilySearch, FamilySearch still isn’t a FHISO member, yet has submitted a paper proposing that FHISO rubberstamp GEDCOM X. Current FHISO members include Ancestry.com, RootsMagic, WikiTree, ourFamily•ology, Calico Pie (maker of Family Historian), Coret Genealogie (owner of Genealogie Online), the American Federation of Genealogical Societies, the Federation of Family History Societies, DC Thomson Family History (formerly brightsolid) and Eneclann. After the mid 2013 announcement of Drew Smith as FHISO chair, FHISO seemed dormant for more than a year, as there was no news at all. In August of 2014, FHISO announced that technical work would begin, and published the standards-setting process they’re going to use. In the few decades since GEDCOM was first introduced the world has changed and genealogy applications have changed with it. In the early years of Personal Ancestral File (PAF), people used many PAF utilities to do things PAF did not do yet, and those utilities read and write PAF files directly. After the introduction of GEDCOM (and a few file format changes that obsoleted old utilities), practically all remaining utilities were reading and writing GEDCOM files. However, just like say Microsoft Word reads WordPerfect files, leading genealogy application do read each other’s data files directly. That is not only a competitive advantage because direct import is easier to use, it also means you can transfer data without using GEDCOM. Practically all genealogy hosting sites let you upload a GEDCOM, but several major sites let you upload data directly from your desktop application, no GEDCOM required. Vendors are replacing the upload functionality with synchronisation functionality, and a few vendors now offer multi-platform applications that synchronise your data between all the platforms – no GEDCOM required. they are also adding features that require GEDCOM extensions. Sometimes they choose to use the same obvious extension as other vendors, sometimes (GEDCOM EL) vendors cooperate to create a common set extension, but often they do they their own thing. 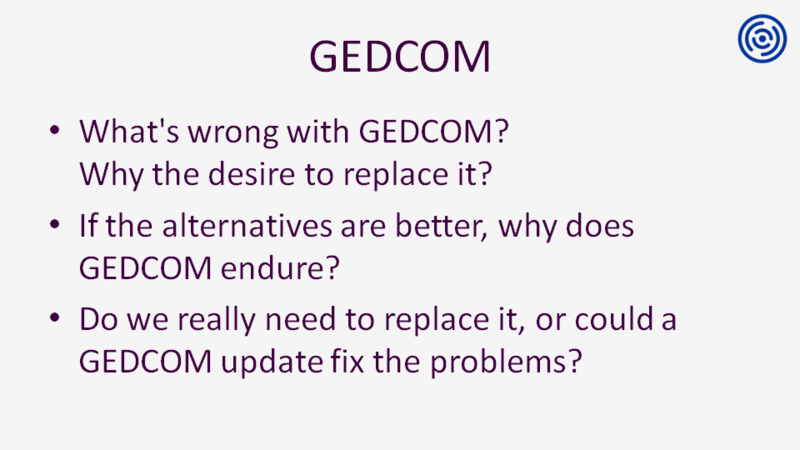 Some vendors try to support third party GEDCOM extensions on import, but many do not. In the case of citation templates, the vendor-specific extensions are not only substantial but also substantially different from one another. 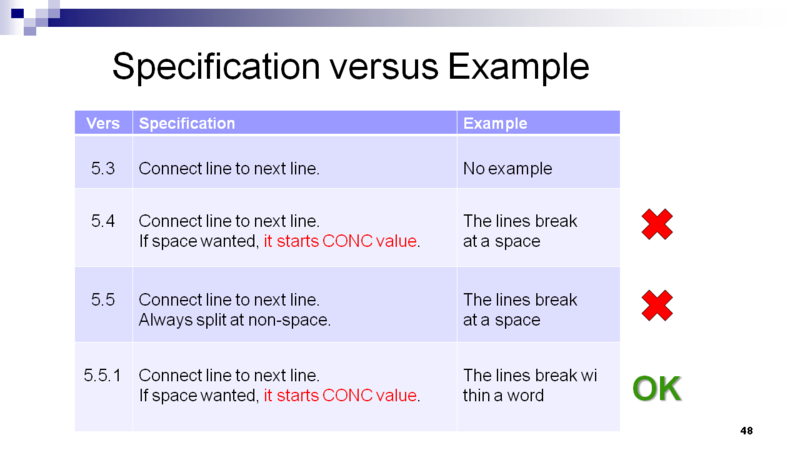 Users who try take advantage of the current vendor-specific implementations of citation templates, experience a mild case of vendor lock-in (that other data still transfers fine isn’t good enough), something a standard data exchange format and it extensibility are supposed to prevent. Five days from now, a panel of experts will opine on these matters in the Gaenovium 2014 Panel Discussion: Current & Future Genealogical Exchange Standards. This entry was posted in Conference, Gaenovium, Technology and tagged BetterGEDCOM, FamilySearch, FHISO, future, GEDCOM, GEDCOM alternatives, GEDCOM X, GEDCOM XML, GEDXML, history, OpenGen, XML on 2014-10-01 by Tamura Jones. Gaenovium 2014 participants will not be nickeled and dimed for every drink or meal. Coffee, tea, lunch and diner are all included in the registration fee. We are developers ourselves, so we know how important a good cup of coffee is. Coffee and tea will be provided by Koffietheek, importer of fine coffees and teas. We will not be serving Kopi Luwak, but you will get quality coffee, and you can drink as much as you like. Early arrivals will enjoy a bonbon with their coffee. There will also be a small selection of sodas. Lunch will be catered by local sandwich shop Drs. A. Sandwiches is all they do, and around noon, their little shop is really busy. They’ll deliver two of their deluxe sandwiches for everyone, and they’ll probably do so in their distinctive bright yellow powered cargo bike. 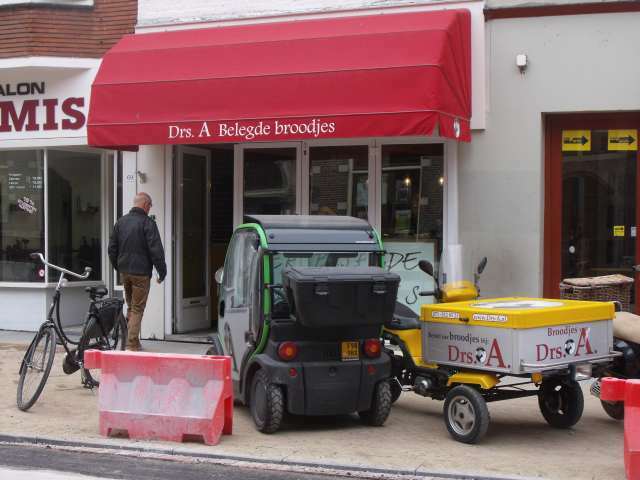 Dr. A sandwich shop, their yellow cargo bike parked in front. We do not send you home hungry. We’ll have a closing diner together. We’ll walk about a hundred metres to Asian Palace, run by chef S. M. Hu, winner of many international rewards. It is close to the Pavilion, and we included them on Gaenovium’s Google map, so it is almost impossible to get lost, but if you, look for two lions guarding the entrance. The restaurant will serve a selection of gourmet dishes from their extensive Chinese cuisine. 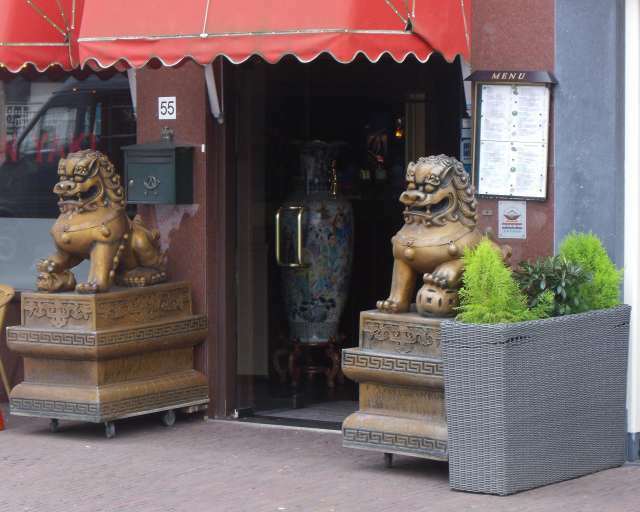 Lions in front of Asian Palace. This entry was posted in Conference, Gaenovium and tagged Asian Palace, drinks, Drs. A, food, Koffietheek on 2014-09-12 by Tamura Jones. In Putting the Pavilion on the Map we showed how we put the Pavilion building on Google Maps. But Google Maps isn’t the only map application out there. Let’s check-up on the existence of the Pavilion on other digital maps and see the importance for not only tourists, but also genealogy technologists. First alternative to check: Bing Maps. Microsoft’s map application, available via an app and the web, doesn’t have buildings though, there are only streets, railways, water and green areas (forest/park). The area where the museum and the Pavilion is located is just a grey area (see image below). There’s no possibility to make changes or add information to Bing Maps. The seconds map application we’ve checked was Apples map product. This application isn’t available on the web, only as an app on a iOS device. 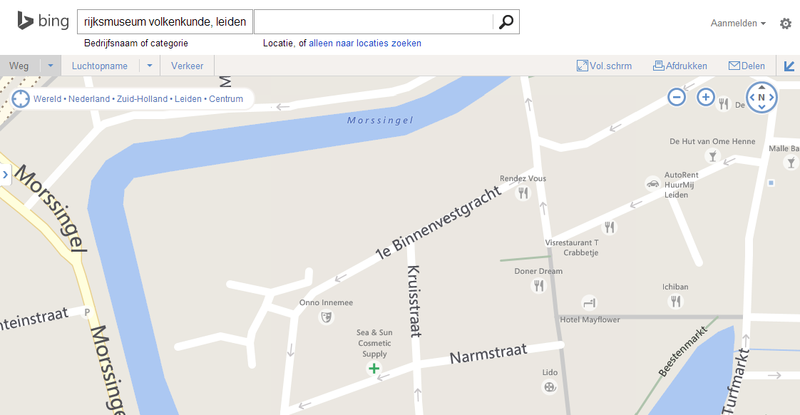 At first glance the map application look similar to Bing Maps: streets, railways, water and green areas. 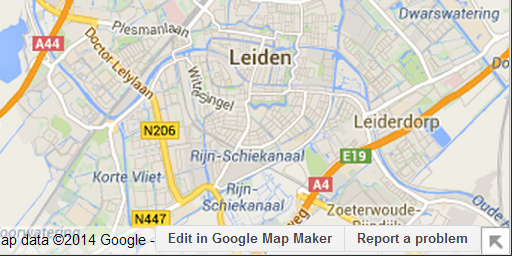 But on the selected area of Leiden there were no buildings visible (see image below). For some cities there are 3D buildings available, but the list of cities is somewhat limited, none in the Netherlands. Like Bing, this application is read-only. 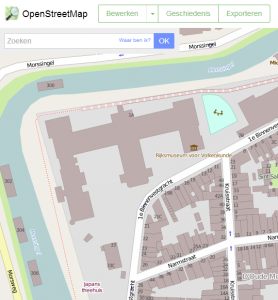 The third map application we reviewed was OpenStreetMap. After searching for the Rijksmuseum Volkenkunde, the right area with the Pavilion building was already visible. A closer look learned that although the contours of the building were present, the name ‘Paviljoen’ was missing. 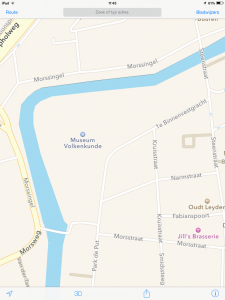 Just like Google Maps, OpenStreetMap has the ability to add/change content. But unlike Google Maps, OpenStreetMap is non-commercial and build up from the ground by volunteers and maintained like a wiki. Anyone can add roads (lines) and buildings (shapes) and edit the appropriate meta-data. The Netherlands’ Cadastre, Land Registry and Mapping Agency – in short: Kadaster – collects and registers administrative and spatial data on property and the rights involved. Part of this dataset (abbreviated as BAG) is available as open data so it can be re-used. Someone has taken this huge BAG dataset and transformed it so it could be added to OpenStreetMap! Apparently, this dataset didn’t include building names. No problem, just login, select the building and add the name to the object. Where Google needed some time to approve the addition, the name of the building was visible on OpenStreetMap within minutes! The ‘open’ part of OpenStreetMap doesn’t stop at open ‘input’, there’s also open ‘output’. The OpenStreetMap data is available for download as open data. This means this rich geographical dataset can be reused! How does this relate to genealogy technology? Some archive records from census and civil registry have addresses as meta-data. Addressed can be marked on a map! Unfortunately, also street names can change over time. 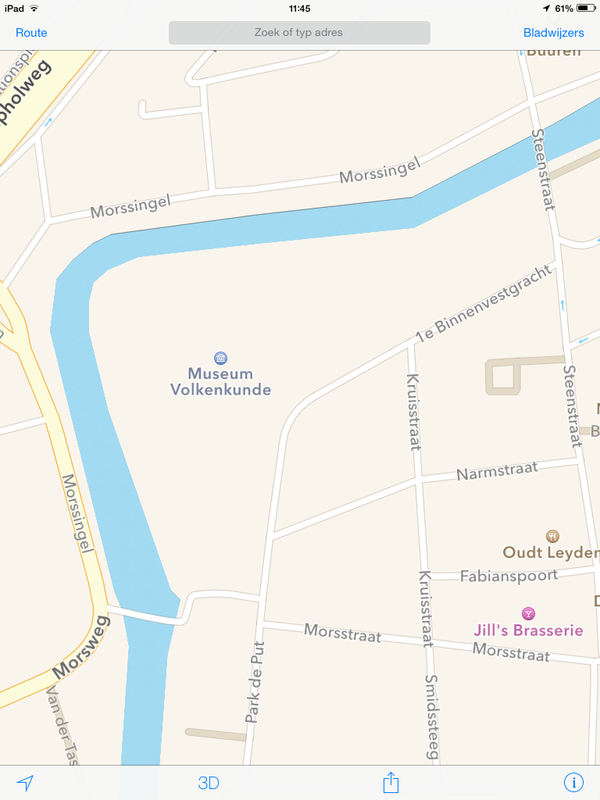 The historic map shown in this examples shows a line for the “1e Binnenvestgracht”, but actually reads the “Boerhavestraat”. When the “1e Binnenvestgracht” was build in 1899-1900 it was actually called “Boerhavestraat” (Source, Dutch PDF). 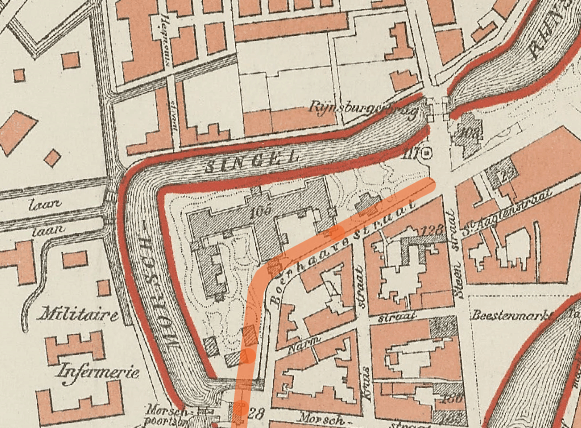 Part of the current “2e Binnenvestgracht” was then called “1e Binnenvestgracht”… Remember, the used map is from 1897, as the record in this example was from 1901, the highlighted “1e Binnenvestgracht” is probably the correct one. By the way, did you notice the Pavilion building on the historic map? Seems there used to be two similar sized buildings near the Pavilion which have disappeared over time. 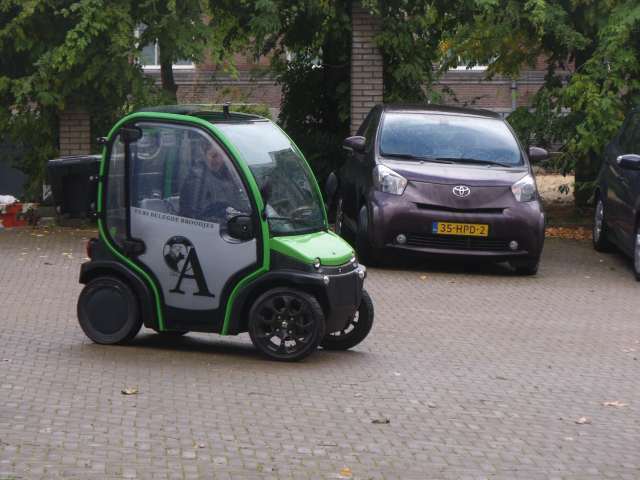 This entry was posted in Gaenovium and tagged crowd-sourcing, Leiden, open data on 2014-09-04 by Bob Coret. Early this year, several genealogy bloggers picked up A Conference Manifesto by Librarian of Fortune Mary Ellen Bates, about how conferences should change, because the traditional conference is no longer serving its purpose; “We are no longer willing to shuffle zombie-like from one conference session to the next, passively listening to speakers talk about what they know.”. When we started Gaenovium, we did not set out to follow tried-and-true formats, nor to do everything differently. We set out to create a conference we might enjoy ourselves. We set out to create a genealogy-related conference in Europe, without forgetting Americans; we’re organising it in the one European city Americans hope to trace their ancestry too. We set out to have a minimal conference fee – our € 45 conference fee includes coffee, lunch, tea, and diner. We deliberately set out to create a real conference instead of a virtual one. A conference for genealogy technologists is not going to be big, it is going to be small, but small is good, small is intimate. We set out to create conference for genealogy technologists, not only so we finally get to enjoy some in-depth genealogy technology presentations, but to get genealogy technologists from different companies and countries together and talking with each other. We had discussion about the desired length of presentations. We are aware that listener attention tends to decrease after 45 minutes, but we do not want presentations to become superficial because of some artificial maximum. We accepted that an in-depth presentation may require more time, but that doesn’t mean that we’ll allow our speakers to be talking heads lecturing to an anonymous crowd, and they certainly will not be able to walk away from the podium saying there is no time for questions any more. There no podium to walk away from, and the Gaenovium audience may well be a more challenging audience than the speakers ever experienced before; a highly educated and knowledgeable audience of genealogy technologists, that is not going to passively absorb everything, but will ask questions and challenge assumptions. That audience will not be an easily ignored large crowd in distant darkness, but a small and visible group, right in front of the speaker. That audience is sure to have questions, and we did our bit to make sure the speakers will have time to answer those questions; first we asked for an estimated duration of their presentation, including question & answer time, and then we generously added another fifteen minutes to their time slot anyway. Perhaps that will result in a bit more time between presentations, but that’s okay; it gives attendees more time to corner the speaker or each other for one-on-one discussions. We designed Gaenovium to be a great event for speakers who love interacting with their audience; organisers, speakers and attendees share the same small building for a day, and then have dinner together afterwards. We’ve seen some blog posts wondering about video recording and live streaming, we’ve even seen some comments that practically demanded that we live-stream the panel discussion. Other than some blog posts may have led you to believe, we never stated that we’re not going to do video. We never stated that we are going to do video either. We set out a to create a real conference, for people to meet up and interact, so creating a video was never high on our priority list. We did not organise sessions to watch via a live stream, we organised a conference to participate in. Please expect nothing, and perhaps we’ll surprise you. However, we can state, with great confidence and conviction, that we’ll not even be trying to do a live stream without a wired Internet connection. The lack of a live stream does not preclude you from experiencing the conference vicariously. We created a social media policy to match the nature of the event. The Gaenovium social media policy does not award the euphemism official blogger to anyone, but deliberately provide all attendees equal access to the conference speakers and Wi-Fi, and expect a modest amount of live blogging and tweeting, hashtag #gaenovium. When we announced Gaenovium, we expected praise, complaints, complaints and questions. We expected many things, we just didn’t expect the Spanish Inquisition. We hope that the presentations and discussions at Gaenovium 2014 will lead to vendor collaboration and cooperation, and improvements in genealogy software. In the short term that might mean say a GEDCOM fix here and a new direct import feature there. At least one blog post about Gaenovium suggested we’ll all enjoy a GEDCOM replacement soon after Gaenovium 2014. Here’s a reality check: FHISO hopes to create a new standard over the course of several years. We are happy if the Current & Future Genealogical Exchange Standards panellists put forth some interesting arguments and generate passionate discussion. We’d welcome a FHISO official on the panel, and promise not be disappointed if they fail to solve all current problems and draft a solution in just one hour. Our expectations are slightly more realistic; we’ll allow them a bit more time, and won’t bother them for the finished product until after diner. This entry was posted in Conference, Gaenovium and tagged conference manifesto, FHISO, genealogy standards, interaction, social media policy, video on 2014-08-16 by Tamura Jones. This is the Pavilion, the location for Gaenovium 2014. The Pavilion wasn’t built yesterday. It was built in 1876, so its existence isn’t breaking news. It is located in garden of the Rijksmuseum Volkenkunde, and the garden is open to the public. So we were rather surprised when we discovered, when creating the Google Maps page for the website, that the Pavilion wasn’t on Google Maps. Google Maps offers several views. The Street View and the Google Map directions aren’t very helpful in getting to the Pavilion, because the Pavilion isn’t located on a street. That’s all the more reason for us to provide clear instructions, and to pinpoint the building on the map, so you know where you’re supposed to be going. Problem was, the building showed clearly on the satellite photos, but it wasn’t on the map. If you used map the view instead of the satellite view, you could be forgiven for thinking that we misplaced our marker. We solved this problem by putting the Pavilion on the map. Literally. You can edit Google Maps. When you log into your Google account to place markers, Google Maps will show a link titled “Edit In Google Map Maker” near the bottom right corner of your browser window. When you click on that, you get the opportunity to participate in collaborative map editing. We did that, took advantage of the satellite photo to create an accurate outline of the building within Google Maps, and about a day later, our map edit was approved. We’d put the Pavilion on the map. This entry was posted in Gaenovium, Technology and tagged crowd-sourcing, Google Maps, Leiden on 2014-08-07 by Tamura Jones. People have been asking us how to pronounce Gaenovium. Gaenovium consists just four short syllables: Gae-no-vi-um. That isn’t much, and none of these syllables is hard to pronounce. The question people are really asking is how to pronounce the ae in Gaenovium, and that’s a good question. English pronunciation is infamously inconsistent, the ae in aerosol isn’t pronounced the same way as the ae in caesium or the ae in antennae. Some words have more than one accepted pronunciation, and those who grew up using the American dialect of English may pronounce the same word yet differently. Those issues didn’t make finding examples that unambiguously communicate the correct pronunciation any easier, but we did it. The ae in Gaenovium is not pronounced like the ae in aerial or the ae in reggae, but like the ae in maestro and vitae. 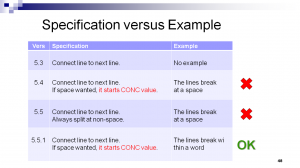 This entry was posted in Gaenovium and tagged how-to, pronunciation on 2014-08-02 by Tamura Jones. We just announced Gaenovium. We’ve sent out a press release. We’ve taken the web site out of beta, with information on the speakers, presentations and venue. We’ve revealed our twitter account, FaceBook page, Google+ page, and this, our blog. It’s a major kilometre mark, signalling that a lot of the journey is now behind us. This journey started years ago, when we got the impression that there are many more genealogy conferences in the USA than the whole of Europe, despite the fact that Europe has more than twice as many citizens, and Americans want to trace their genealogy back to Europe. Every time we discussed this, we agreed on the idea that there should be more genealogy conferences in Europe. Another idea that kept coming up in these conversations was that all those conferences cater to users of genealogy technology, and that the creators of that technology should have their own conference. About two months ago, we decided to stop talking and start acting upon these ideas. We decided to start organising Gaenovium, the genealogy technology conference – except that we did not call it Gaenovium yet. We had no name or anything else yet. We only had the decision to start doing something, to organise a conference for genealogy technologists. We had no name, no logo, no location, no website, no speakers, no sponsors, nothing. Most crucially, we had no experience either. Sure, we had each managed some projects and organised some small events, but we had never organised a conference. This inexperience was our most valuable asset, in that it enabled us to decide, with completely unfounded confidence, that we’d create and organise a brand new international conference from scratch, and do so within a few months. Right now, we are painfully aware that the time frame we gave ourselves was crazy short, but here we are. Slightly more than two months after we started, we’ve announced the conference, one that’s quite different from regular genealogy conferences, and here are some notes on how we got here. We immediately realised that a conference for genealogy technology creators will draw a considerably smaller crowd than a conference for genealogy technology users, dozens not thousands. Some might see that as a serious disadvantage, we saw advantages. Small is intimate. A small group allows more interaction between presenters and attendees, ample opportunity for Q&A, perhaps even some impromptu discussions. That it would be a fairly small group also meant we could pick from a larger number of smaller locations, and could even include a closing diner for the entire group. We had serious trouble coming up with a good name. In fact, when we first approached a potential sponsor, we were still using the place-holder name GenCon, which is just an abbreviation for Genealogy Conference. We sent many emails back and forth in search of a name we both liked, and when we finally hit upon Gaenovium, we knew we had our name. We like that it contains every vowel in the alphabet exactly once, we like that the twitter handle was still free, but what we like even more is that when we first googled it, our google search returned zero hits. There were setbacks. A few quick calculations convinced us early on that it was going to be hard to put on a conference without a sponsor. The first time we asked for sponsorship we were confronted with a PR person who did not just fail to understand what we were doing but did not even try to understand, never bothered to give us a call to discuss things. That casual disinterest was more than a little disappointing, it was hurtful, but we did not give up because of one setback, and that one PR rep turned out to be the only person who did not care to know what we are doing. Everyone else we spoke to was quite interested in and supportive of our initiative to create something new. Once we told our contacts what we were doing, most kept asking questions. Getting sponsors turned out to be easier than our first experience suggested. The first two questions a potential speakers asks are when & where, the third question is how big. 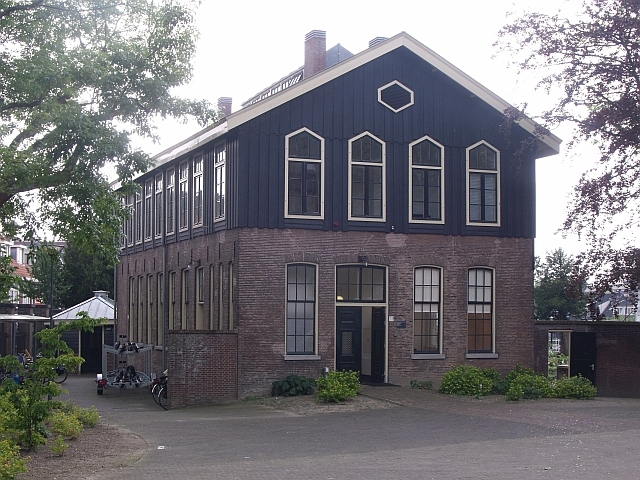 We had already decided a date and the town of Leiden, but to answer all three questions we needed to settle on a venue. Problem is, we had no way of knowing or even guessing how many people would want to come. Our conference is different in more than one way, but we would not even have known how many attendees to expect if our conference had been similar to other conference, simply because ours is in Europe. Still, we had to pick a venue, so we did. The Leiden Archive was kind enough to offer us the use of their auditorium, but it is fairly small. We settled on something slightly bigger venue, within walking distance of the Central Station and several hotels. At times we’ve wondered whether we could ever interest enough people to fill it, at others times we wondered how many people we’ll have to disappoint. We still have no idea how many people will sign up, but hope to disappoint many. Wait, that did not come out right…well, you what we mean. Gaenovium 2014 features an international roster of speakers on a variety of genealogy technology subjects. Each of these speakers agreed to do their presentation for no more than a free conference pass. For most of them the travel cost is more than the cost of pass, and for some of them it’s way more, yet they still decided that joining our crazy project was worth the cost. Some agreed to upgrade an existing presentation, others agreed to create complete new ones. The level of enthusiasm we encountered for our initiative was truly encouraging. We asked everyone we talked to keep things confidential until our announcement. We wanted to focus on getting things done, and simply weren’t ready to start giving answers before we had figured out the questions. We never asked anyone to sign a non-disclosure agreement, we just asked them to keep quiet, and we’re grateful to all of them for keeping mum while we were still busy creating things, for letting us create the conference in quiet and announce it ourselves. We’re grateful for all the people who put their trust in us. It would be false modesty to suggest our names don’t count for anything – when your personal website gets a few million hits per year you know better than that. It is a fact that we’re well known genealogy technologists, but it is another and more important fact that we had no experience organising an international conference, that we were learning how to do it while doing it. We have been upfront about our inexperience, yet sponsors and speakers still trusted us to bring everything together and make it work. Their trust, more than anything else, is what enabled us to go ahead; if those speakers and sponsors had not joined our adventure, we wouldn’t be announcing anything. So, here we are now. What started out as just some ideas thrown around in discussions has matured into an unique conference concept. A lot of work has been done; we have a name, a logo, a venue, speakers, sponsors, a website and a blog. There’s a lot more work to be done, and we’re sure something will go wrong somewhere along the way, but we’re eager to tackle those problems and make i all work. It’s exciting and scary at the same, but we’re happy that we’re no longer just talking about it, but actually doing it. This entry was posted in Gaenovium and tagged kilometre mark on 2014-07-24 by Tamura Jones.